The furnace guys are coming tomorrow to clean our heating ducts. The construction dust seems to be perpetual and we can’t seem to get the house clean. Friends suggested getting the heating ducts cleaned so we are. Since I had to pick up my sewing room a bit for the furnace guys to able to access the vents I figured I might as well tell you about my sewing table while the room is not a complete mess. I get asked fairly frequently what is my sewing table and where did I get it. After much thought & deliberation about what I wanted in a sewing table, my primary goal was to have something sturdy. I had been sewing on an old banquet table (and this was the old heavy metal legs kind, not the newer plastic legs kind) I really wanted a table where I could drop my machine into the table and when I wanted to sew at top speed it wouldn’t bounce all over the place. The banquet table was originally brown and I eventually painted the surface of the table top white. While it was heavy to lift and haul anywhere it would still bounce a fair amount when I floored the pedal on my machine. This isn’t the most attractive table but it is by far the most sturdy one I have ever seen! It is from Sew Perfect Tables. I did run across Sarah’s blog some time ago where she painted the base a very cool lime green. I may have to do that one day. But it is very low on my list of things I want to do around the house. I ordered it off their web site. It’s not as expensive as those cabinets with all the cool little fold up storage tricks. But it is more expensive and much more sturdy than your standard JoAnn’s or Target or Walmart cabinet. There are heavy bolts on each side of the drop-down shelf for the sewing machine so that you can customize the height to any machine. There are also heavy bolts on the legs to adjust the height of the actual table as well. I also ordered the extension table which attaches to the back of the sewing machine table. The hinges that connect the extension to the table don’t seem strong enough to handle the weight of the extension. It is heavy! In retrospect, I wish I would have done what Sarah did and bought an extra base and attached it to the extension. I think it would make the extension feel more sturdy. I may do something like that in the future if I ever get to graduate to a bigger sewing room. My room right now is TINY and I am constantly rearranging and putting the extension up & down. The one piece of customizing that I did do was to have an insert made at a local store (Tap Plastics) that fits around the sewing machine. The one that can be ordered from Sew Perfect Tables is clear plastic and leaves a very large space to the right of the sewing machine that felt like wasted space as well as a hole where pin cushions, scissors and all sorts of things could fall into. So I had a custom insert made out of white plastic and positioned it so that the machine is all the way to the right of the dropped shelf and no hole is left for things to fall into. I don’t have a picture to show you of the insert before. You can see my custom insert above in the first picture. I like that it is white because the clear seems to give me a terrible glare when I am strip piecing blocks. Plus, I can’t see all the dust that collects underneath the sewing machine! UPDATE: I finally found the photo (above) of the original insert that I ordered with the table that shows the big gap between the sewing machine & the table. I returned this insert since it was not going to work well for me. Let me know if there are any other questions you have about the table and I’ll edit this post to answer them. After the furnace guys leaves… I’m back to the sewing machine to finish a couple of charity quilts. And a messy room again! What kind of company did you go to to make the insert for the cabinet? Our local company is Tap Plastics (http://www.tapplastics.com/) They make all sorts of plastic & fiberglass things. Hi – I can’t believe the great timing on this post. I’ve been looking at this table forever and have now just finished up 2 quilts without a table like this and vow I’m done with all the struggling. I have emailed the company the question I’m going to ask you but got no reply which made me postpone my decision. I am almost 60 and I live alone. I am in decent shape. Is this a table I could assemble myself? I would say that it is not the easiest table to assemble. It’s not a matter of age or fitness, but that it is an awkward table to assemble. My hubby helped me put the parts together and level the table. It helps if one person can hold the drop down shelf for the machine or the table itself while the other is tightening the bolts in place. If you could find someone to help it would totally be do-able. I have always loved this kind of table where the machine is at same level as the table. Thank you for the information, Anita! How close is the sewing machine to the front edge of the table? Also, how much did your custom insert cost? Thanks for the post! I’ve been looking at the same table and I think now I will take the plunge and buy it. I love the table! But hubby is not sure. You said the top is plastic. Is it solid? I have sewn on craft tables and it bounces pretty bad. I am seriously thinking about getting 2 tables. As of right now I have particle board rolling cabinets. Who knows how long they will stay together. Also I am like you and would like to replace the insert. Thanks for your help. Question on the plastic insert you had custom made… how did you go about that? Did you draw out what you needed? What thickness did you use? How does it not fall all the way through the opening? Any advice you can give is most appreciated! Thanks! I kind of went the backwards route with the insert. I initially ordered the one that came with the table but was disappointed that there was a huge gap to the right of the machine. So I used that as a template and traced around it on a piece of foam core. Then I lengthened it to fit the space and eliminate the gap, cut it out and tried out my machine in the table with the foam core in place. 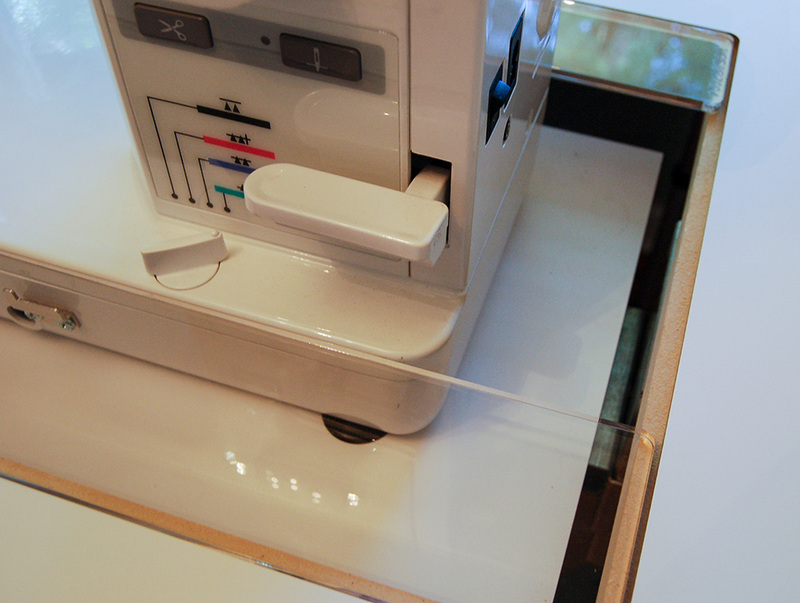 When I took the foam core template to Tap Plastic, they were very familiar with making sewing machine inserts. All I gave them were the measurements from my template and they cut it for me. I returned the original insert since it didn’t fit the way I had expected it to. Inside the table there is a ridge that the insert sits on to keep it in place. The plastic seems to be very strong. It’s probably 1/4″ thick. Thank you, so much, Anita! Sorry, one more question I forgot to ask… does the insert (“tray”) where you keep your machine lower and raise? My machine is a combo embroidery / sewing machine so I do need it to sit on top of the table when embroidering. Thanks again! should my sewing machine table be on a rug? Is your table the original sewing table or the one for quilting? Thank you. I love your task light- appreciate details. You are currently reading My Sewing Table at Bloomin' Workshop.